Evensen, D. (2013). String Theorist. 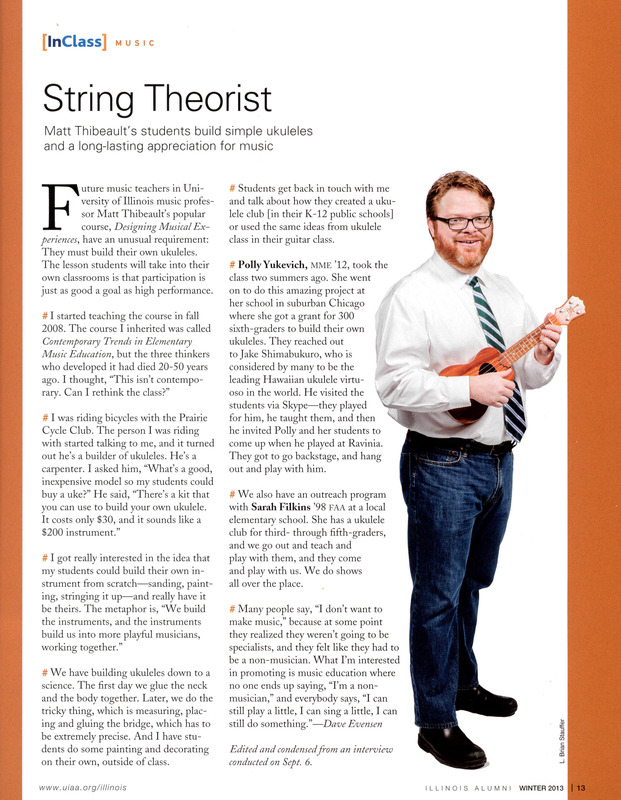 Illinois Alumni Magazine, p. 13. Rhodes, D. (2012). Let’s Play. University of Illinois at Urbana-Champaign 2012-13 Campus Guide, p. 38-39. O’Daniell, R. K. (2010, November 5). Uke it or lose it. The News-Gazette, p. B2. Urbana, IL. 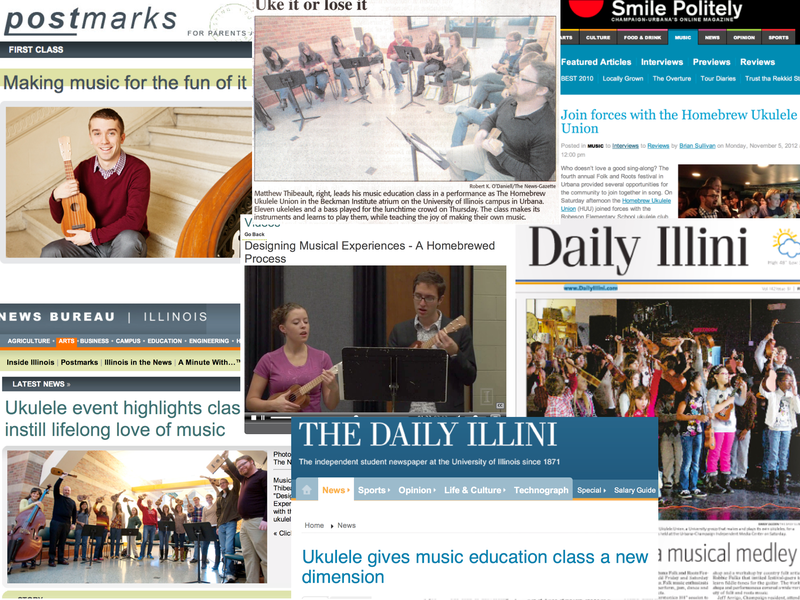 There’s enough media around our Homebrew Ukulele Union that we have our own blog. Head over there for more of that. John Dewey’s “My Pedagogic Creed” audiobook: A group of students and I co-created an audio version of Dewey’s classic essay. Old Verses, New Voices: A more recent project, presenting recordings of poems from the public domain, as described in my recent column in General Music Today, “Recording Students to Bring Poetry Alive” (January 2011 issue). Interesting Musical Moments Illustrated: A Visualization Project For this project, students created spectrogram visualizations and then annotated them. Viewed with Acrobat Reader, you can click each image and hear the music, too! Homebrew Ukulele Union: Here’s two videos from the group in my course “Designing Musical Experiences”, where we build our own ukuleles, create our own charts, and share leadership responsibilities. You can see a run-through of “In C” and some clips from a singalong event at a local pub. I made a living from 1991-1998 as a bassist, playing 2-4 nights a week. Mostly it was blue collar work in blues bars, dive bars, and with tiny community orchestras, but I also worked as a bassist for the Tallahassee Symphony Orchestra and got to play with some amazing jazz musicians. Here’s a few samples for example from throughout the years.